Welcome to the World of the- Magic Mushroom! Almost everybody has had a slice of pizza in their lifetime, and a good portion of those may have contained mushrooms. Although preferred by many, some people wince at the thought of eating a fungus. Unfortunately, these people are missing out on an immensely diverse and influential kingdom in the tree of life. Most likely, the types of mushrooms you've consumed only provide some flavor and nutritional value to your diet. But, have you ever considered consuming mushrooms for a medicinal purpose or even a mind-altering experience? Here, you will learn about a single mushroom species that is capable of both! 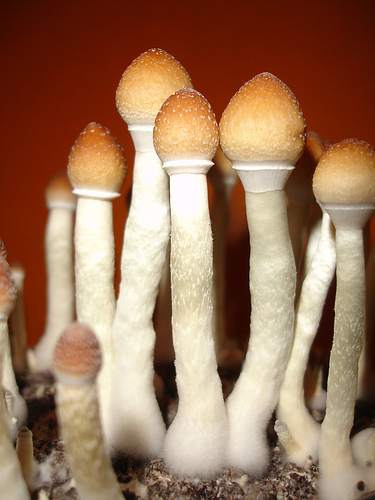 Psilocybe cubensis has been shown to prevent headaches and could also be a natural alternative for anti-depressants. Before leaving this site I hope that you will have a better understanding of this controversial mushroom. The first topic discussed is the etymology of P. cubensis.